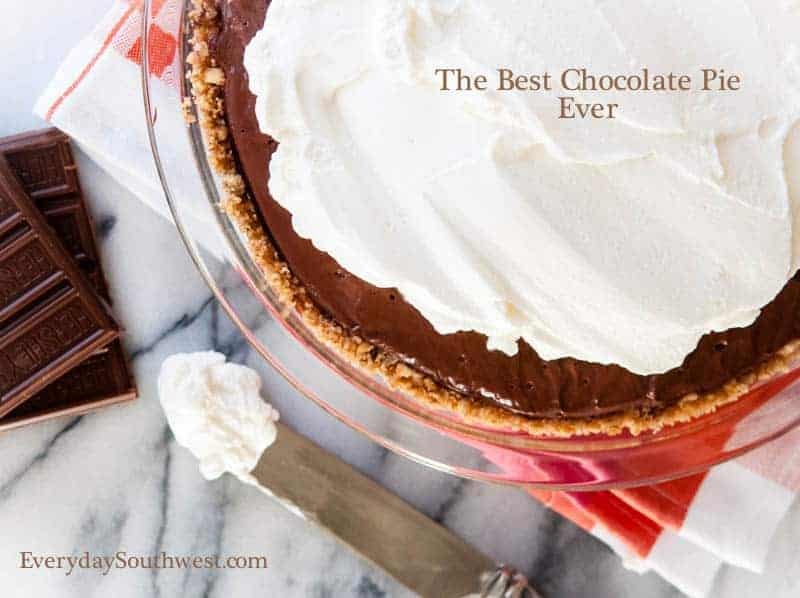 This is simply the Ultimate Classic Chocolate Cream Pie Recipe. It’s creamy and milk chocolate-y with a touch of crunch from the nutty graham cracker crust and a hint of cinnamon , the perfect chocolate dessert. I don’t know exactly how long ago the story of this chocolate pie recipe began, what I do know about its past begins with Lola. Lola was a warm and friendly woman that lived in a sunny yellow kitchen near main street. There was always a big breakfast or sandwich waiting for you when you walked into Lola’s kitchen (whether you really wanted one or not). Lola was well-known around town for her cooking but, she was famous for her baking—especially her chocolate cream pie. One day, telegram came to the sunny yellow kitchen. It was from Lola’s son, The Army Officer, who was coming home after serving for 5 long years in the South Pacific during World War II. Her son loved The Chocolate Cream Pie and Lola knew she would have one waiting for him when he walked through her kitchen door. What Lola didn’t know was that the young Army Officer was bringing his bride home to meet his mother for the very first time. Lola took a picture of that day, a faded black and white photograph of The Army Officer in dress uniform, his arm around The Bride in a wide-brimmed hat and polka dot dress with a chocolate pie stain on her lap. In her nervousness at meeting her new mother-in-law, The Bride dropped a piece of The Chocolate Cream Pie on her lap. Lola’s camera captured the moment for everyone to share. Over the years, The Chocolate Cream Pie has undergone some changes. When Lola passed, The Bride became the official “maker of the pie.” The Bride was not known for her cooking the way Lola was so, she did what any good homemaker in the ’60s would do, she changed little bits of the recipe to make it easier to prepare. She also changed Lola’s flaky crust (the crust The Bride could never quite master) into a more forgiving graham cracker crust. This new version of The Chocolate Cream Pie was just as delicious and it kept The Army Officer happy for over 60 years. Finally, the day came when The Army Officer’s son called on the telephone. He was coming home from college for a visit. The College Student asked The Bride to make The Chocolate Cream Pie for him. What The College Student didn’t say was that he was bringing his Best Girl home to meet his family for the very first time. There is no photograph to capture that day, the young College Student with his arm around his Best Girl (who was just as nervous to meet his mother) but, The Chocolate Cream Pie was there. For 35 years, The Best Girl has been making Lola’s Chocolate Cream Pie for her little branch of Lola’s family tree. And, just like her mother-in-law, The Best Girl has put her own little touches on Lola’s cherished recipe. I hope you like my little story. It is 100 percent true and this perfect little chocolate cream pie has captured every moment of the Hoopes Family’s life. My mother-in-law (the bride) changed Lola’s pie recipe by adding a box of pudding to the base so the filling will turn out perfectly every time. She also added the graham cracker crust. My little touches to Lola’s amazing chocolate pie recipe are the toasted pecans and cinnamon in the graham cracker crust. I also added my “method” for making the crust that leaves the crumbs larger for more texture than usual. Please do try this chocolate pie. It’s fast, easy and just can’t fail. It will make your family happy for years to come. NOTE-This recipe makes TWO large pies. Thank you for stoping by Everyday Southwest! Be sure to follow us on Facebook or Twitter and sign up for our email updates so you will never miss a new recipe. have too much wax and stabilizers), broken into pieces. Break the graham crackers into small pieces and place them in a food processor and process until they are large crumbs but, still have a texture. Do not over process into powder. Work with smaller batches to keep the size of the crumbs even. Pour into a bowl. Chop the pecans until finely chopped (I buy them chopped and then chop them a little more). Place crumbs in a dry frying pan over medium high heat and toast lightly until you can smell the aroma. Add the pecans, sugar, cinnamon and salt to the graham cracker crumbs and stir until well combined. Drizzle in the melted butter and stir well so that all of the crumbs are coated with butter. Divide the crumb mixture in half and scoop into two 10 inch pie pans. Using the bottom of the measuring cup, press the crumbs evenly into the bottom and up the sides of the pie plate. Place the pie crusts in the refrigerator to set while making the chocolate filling. 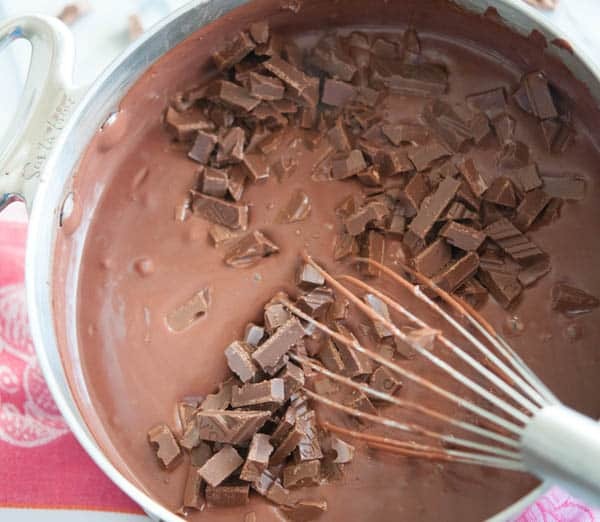 Pour pudding mix into a large sauce pan, and slowly add the milk while whisking. Whisk together until there are no lumps. Stir constantly and cook over medium heat until the pudding comes to a full boil. If the heat is too high, the pudding will scorch. Keep stirring or the pudding will scorch and stick to the bottom of the pan. You may inch up the heat a little if necessary. Remove the pan from the hot burner the minute it comes to a boil. Quickly add the cubed butter and stir until melted. Then, add the chocolate pieces and stir into the pudding until melted and well combined. Add the pinch of salt and stir. Pour the pudding into the pie crusts. Cover each of the pies with a piece of plastic wrap. Make sure the plastic wrap touches the surface of the hot pudding and completely covers it so it will not get a "skin" on top. Return the pies to the refrigerator until chilled. Whip the cream until it begins to thicken. Add the powdered sugar and the vanilla and whip to stiff peaks. Remove the plastic from the surface of the pies. Divide the whipped cream over the pies and smooth all the way to the edges of the pie crust. The pudding that is not covered by cream will turn dark. Refrigerate again to set the whipped cream. Thanks, Maureen! You must try this pie. It is so easy, but soooo delicious! Thank you for your question, Rebecca! I’m glad you asked. It looks like I need to clarify that in my post. I haven’t tried to cut the recipe in half because of the jello pudding mix. The recipe does make two very large pies that are filled to the very brim of the pie crust and mounded up a little in the middle so, 1/3 of jello pudding mix is not quite enough, 2 boxes is too much for one pie (I make little parfaits in clear plastic cups with leftovers and freeze them for later). But, if your pie plate is smaller, around 8 inches, 1/3 of the recipe will be enough. I am posting a recipe for the chocolate pie parfaits today. I have experimented with a smaller batch and it works great! You may want to take a look at the Chocolate Pie Parfait Recipe post that will go live this afternoon. Thanks you for stopping by Everyday Southwest! We love hearing from readers! I’ve been looking for a good chocolate pie recipe to make for my husband. This looks like a wonderful recipe. Does this make 2 or 3 pies? Hi Leeanne, Thank you for the question, it looks like I will need to clarify that in my post! This recipe is intended to make to very large pies. My pie plates are 10 inches and my mother-in-law’s are even bigger! The chocolate filling should fill the crust up to the brim and even mound up a little in the center. I usually have some of the chocolate filling left over that I make into parfaits to serve at another time (they freeze well if you use the little clear plastic cups). I have stretched the recipe into 3 pie plates before by using the smaller, (I’m guessing 8 inches?) disposable pie tins you purchase at the grocery store when I wanted to give them as gifts at the holiday. The the pies are not quite as full and luscious that way, but still very delicious! I hope you love them! Thank you! It did seem like a lot of filling, so glad to know how much it makes. Does this make 2 pies? Hi Monica, Yes, this is intended to make 2 large pies. We use the largest pie plates we can find. Mine are 10 inch and my mother-in-law’s are even bigger. The pie filling should be piled high and mound up a little in the center. Also, we don’t skimp on the whipped cream. One cup per pie of whipped cream is not quite enough. I stretched this recipe into three smaller, 8 inch pie shells this last holiday season and it did fill three of the pies although the they were not quite as full and luscious. There is usually some pie filling leftover that I put in those clear plastic cups and serve like a parfait a day or two later. 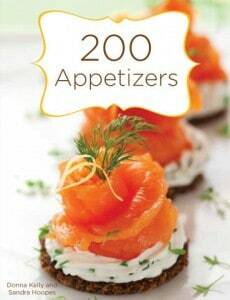 I hope you try this recipe, we live it! 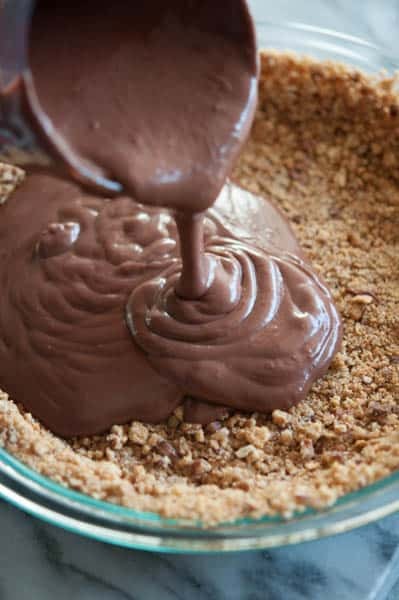 I noticed that the ingredients are somewhat different for the graham cracker crust recipe when it is by itself (The Best Graham Cracker Crust Recipe) and when it is included with the Classic Chocolate Cream Pie Recipe and a Love Story. Since they apparently both make two crusts, I was wondering which recipe to follow. Thanks for the clarifications. I just made this pie BUT I did not read the comments before preparing. I am only making one pie but followed your directions for the amount of filling (obviously too much). I tried to scoop out extra filling with a ladle but it seems to be too thin and taking forever to chill/thicken. Help! HI Sarah, I just got notice of your comment. I am soooo sorry you are having difficulty with the pie. I have never had a problem with the pie before. It does make two pies and the directions do say to divide the filling into the pie plates. As to why the pie is not thickening? I am not sure. The filling actually begins to thicken right away, as soon as it is scooped out of the hot pot and begins to cool. I can only think about checking the ingredients ,it calls for 3 large (5 oz) boxes of pudding and NOT sugar free, as mentioned. The sugar helps to thicken things. Also the amount of milk is 9 cups, 3 for each package of pudding as indicated on the boxes of pudding, as well. The Hersey Chocolate also adds thickness. Please check the ingredients and let me know if that is the problem. I will worry about it until I know you are happy with the recipe. OMG! I think I’ve died and gone to heaven! This looks way beyond wonderful. I’ve got it pinned for later. Thank you! Thank you for sharing your wonderful story and recipe. I can’t wait to try it! I’m sure it is delicious. Do try it, Pam. It has become favorite dessert for my family, as well! sounds great, but can you use a store bought graham cracker crust? What a yummy pie recipe! My whole family loved it. I’m keeping this recipe to make it again. I love the touch of cinnamon in this recipe! It takes it over the top!